I’m a big fan of Julia Cameron and The Artist’s Way. She recommends two pivotal tools to foster creativity: Morning Pages, which are three pages written long-hand every morning upon waking, and Artist Dates, weekly “play dates” that you plan for yourself. Yesterday, my weekly Artist Date to me to a local auction. What fun! It’s such a lesson in human psychology to watch people’s behavior at auction. On a microcosmic level it reflects the same feeding frenzy that we see in the stock market and the marketplace. Whether you go to live auctions or just play on eBay, the most important rule for successful auctions is to Know Your Maximum Bid. Set this maximum bid while you’re level-headed, before the bidding begins. And stick to it! Of course, this means you will lose occasionally. 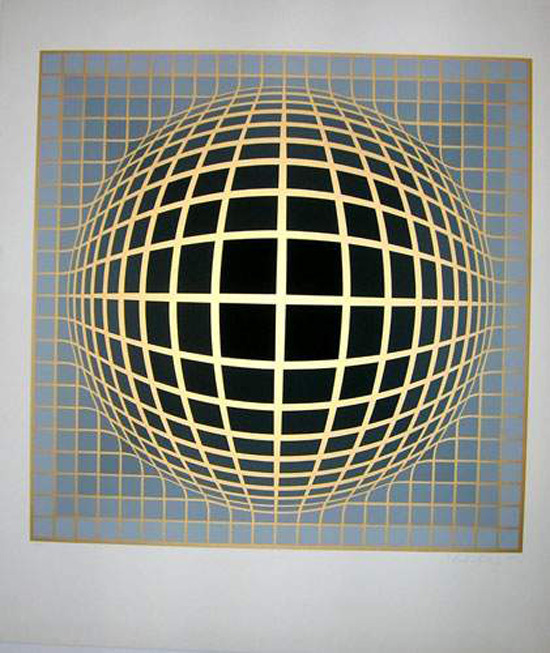 For instance, yesterday I just missed out on the grey version of a vintage 1970s Vasarely lithograph like the one shown above. I really wanted this little guy and I knew just where I’d hang him on my wall. But alas, even though this piece went off waaaaay below market value, I drove home empty-handed because the winning bid was still slightly higher than my pre-set maximum bid. So while I was disappointed, I was also proud that I had stuck to my guns. Believe me, it can take quite some time and a whole lot of dollars to develop this discipline! And I’ve learned not to cry over lost auctions. With the creativity fostered by Julia Cameron’s Artist Dates, your creative self will always find an alternative. Like today’s VPOD, for instance. 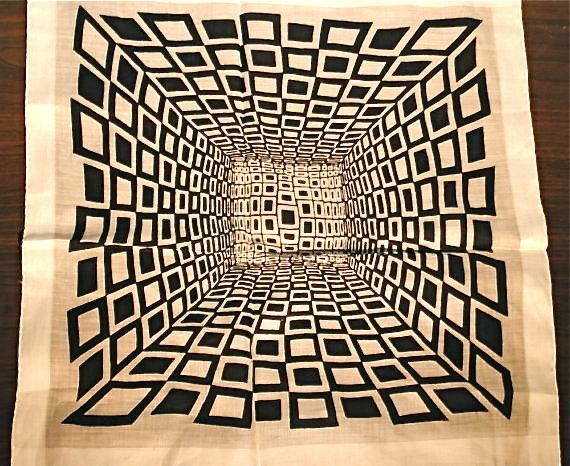 Until another Vasarely comes my way, I can frame this fantastic, unused vintage op art handkerchief and get the same vibe for thousands of dollars less. 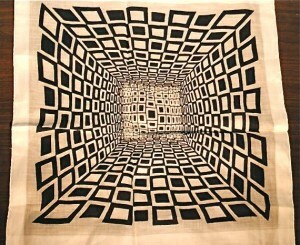 It’s quite an artistic find for a vintage fashionista! Available at Decades of Baltimore.